Stealthy and quiet, kitsune are able to explore without being noticed, sneaking into dangerous territories with ease. This talent is extremely helpful in obtaining eggs from unsafe places, where magi dare not venture themselves. Gently carrying these eggs back in their mouths, kitsune can evade almost any creature with their nimbleness. Seemingly never tired, kitsune make wonderful allies on journeys, rarely needing to rest. Arctic foxes, adapted to frigid lands, are extremely useful companions to magi traveling to Arkene. Places impossible for a magi to go are easily accessible to these creatures, and eggs from cold lands are found more easily with their help. 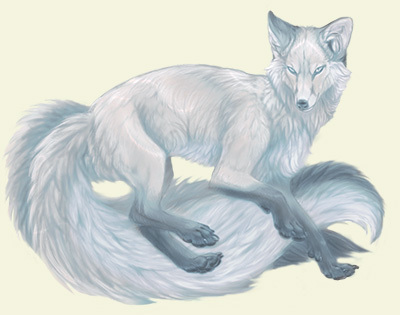 With a icy white color, kitsune stand out brightly against grass, with a blue marking on their long, bushy tails. Stealthy and extremely agile, it's incredibly difficult to track one of these foxes to its snowy lair in search of eggs. Its white fur makes it difficult to hide in warmer climates, but these creatures mostly live in arctic terrain, where they have adapted to the harsh habitat. With superior intelligence and magical powers, it is impossible to catch a wild kitsune. Raised by magi, however, these creatures are friendly and sweet, and not as cautious as their untamed kindred.